This is a translation of a column that was featured on the website of the Association of Dutch Art Historians and in the Dutch local newspaper Harlinger Courant on February 20, 2014. ‘Extreme artist designs fountain for Harlingen.’ This is the headline of a newspaper article that my mother recently sent me. After an initial feeling of surprise, I understood that for the Eleven Fountains Project, part of the prelude towards Leeuwarden European Cultural Capital 2018, each of the eleven Frisian cities will get a fountain designed by a renown artist. For Harlingen, the city I was born and raised, Marina Abramovic will demonstrate her best design qualities. My surprise is twofold. On the one hand it is based on the difficulty of connecting a world famous artist to my old hometown. My head goes through the calendar: ‘no, it is no April Fools yet.’ On the other hand I am surprised that someone who gathered fame with performance art will be designing a fountain. If you are good in one artistic discipline, does that mean you are good in another as well? The local newspaper also seems to have troubles with imagining an answer to this question. The article describes the artist as follows. ‘Abramovic works on video art and performance and is known for her exhausting and severe performances during which she has often mutilated herself.’ The article is so preoccupied with the sinister aspects of Abramovic’ oeuvre (wounds, blood, skeletons), that it is impossible not to question the kind of fountain this will result in. In the next edition of the Harlinger Courant this cross-pass is finished without much effort. Under the title ‘Does Harlingen need any more mutilation?’ a concerned citizen shares his thoughts about the project. He feels that the skyline of Harlingen is full enough, without the ‘abominable influence’ of ‘this lady’ who likes to attract attention by harming herself. Whether you feel that the skyline of Harlingen is fully built or not, and whether you are familiar with the work of Abramovic or not; this letter is understandable in response to the portrayal of the artist by the local newspaper. The term ‘extreme’ is fitting regarding the oeuvre of Abramovic. Since the early seventies she has explored her physical and mental stamina through her performances. By performing these in front of an audience, she simultaneously confronts the audience members with their physical and mental willpower. How long can you as audience member look at someone lying naked at a block of ice, before the knot in your stomach becomes too big and your moral judgment yells at you to get her out of there? But the bloody characterization presented by the newspaper is not complete and certainly not representative. Abramovic’ recent work is still extreme, but in a completely different way. During the monumental The Artist is Present (2010) in the New York MoMA, described in the article as a performance during which ‘visitors could sit across from her to look at her’, she moved many a visitor to tears. In the museum atrium she created a safe haven, in which every museum visitor could decide on the length of time of sitting across from the artist. The emotions will have been caused for many because they had a feeling of being seen. It was no looking and being looked at, but a form of truly felt contact. Last summer I visited the performance 512 Hours, in which the focus was on the contact of the visitor with him- or herself. In the London Serpentine Gallery I left my watch, phone, coat and bag behind in a locker and entered the silent gallery space. 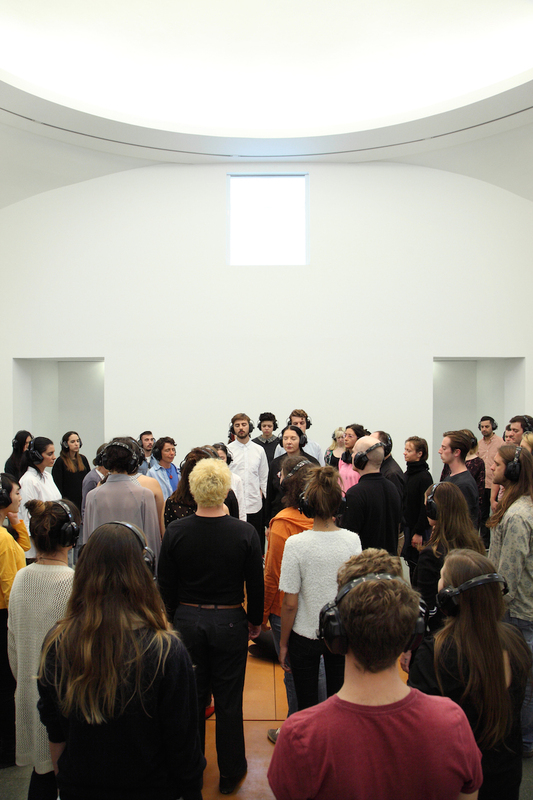 With me there were about 75 others who, on directions of Abramovic, reached utter peace and quietness. My experiences varied from a confrontation with my own stream of thoughts that seemed impossible to be stopped, to utter enjoyment of being away from the busy world out there. It remains a point of discussion whether this performance falls within the category ‘art’ or whether it was a course in Mindfulness. What matters is that this performance also offered a special place: a place of seclusion and contemplation. When I left the gallery space after an hour and a half, I felt like I could take on the world again. In contrast with her earlier work, The Artist is Present and 512 Hours did not revolve around the notion of repulsion, but rather around attraction. Abramovic offered, by means of herself, a place, room and time to have a truly felt experience. To completely seclude oneself. To step out of time. To reflect on the world you left behin. To think about absolutely nothing. Or at least give it a try. After leaving the gallery, the world was to be a little bit different for good. This is a completely different Abramovic than the one who was portrayed in the newspaper article and the one that the concerned citizen responded to. Not an artist that mutilates, but one that calls for admiration. And not only admiration for her art, but for so much more. For the felt experiences and for the meaning of life. I hope that Abramovic will be able to translate this approach into her fountain design. That she will be able to realize a place of contemplation and reflection at the pier of Harlingen. Because whether the skyline of Harlingen is full or not, such a place will be of considerable added value. This is a very thoughtful and inspiring comment, and most certainly well-written. The indicate doubt about whether the author of the column took part in a living piece of art or a course of mindfulness calls for further considerations. The more so, since such phenomenona are increasingly approaching each other. The attempt to combat parochialism and narrow-mindedness while also sincerely acknowledging the drive behind it is also well-taken. Yet, one should never sacrifice art at the altar of ignorant criticism.